Legendary cowgirl Sherry Cervi combined a competitive spirit with a strong work ethic from a very young age. Even as a child running barrels in her parents’ front yard on her stick horse, she was determined to do her best. 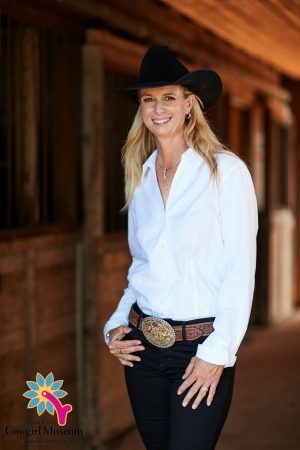 That push to compete resulted in a career as the all-time highest earning cowgirl in the Women’s Professional Rodeo Association (WPRA), becoming an icon in rodeo history. Sherry grew up with ranching and competing; her parents Mel and Wendy Potter operated a horse ranch in Marana, Arizona, and a farm in Bancroft, Wisconsin, while they competed at the National Finals Rodeo (NFR). From the start as a child, she put in countless hours grooming, practicing, and riding. At twelve, Sherry purchased her WPRA card and began rodeoing professionally. Though successful, she struggled with barrel racing, which happened to be her favorite event. After high school, Sherry enrolled in Central Arizona College to join their rodeo team. She began riding a gray gelding in 1994, Sir Double Delight, better known as Troubles, and this partnership overcame any hurdles in barrel racing. At nineteen, she qualified for the NFR and won the Reserve World Championship. Sherry married Mike Cervi in 1995, qualified again for the NFR, and was the World Champion for the first time in her career. As the contestant coming into the NFR with the most money won that year, she wore the coveted number one back number. She was the second of only three women to do so. She won her second World Champion Title in 1999. Shortly after Sherry’s 26th birthday in September, Mike was tragically killed in a private plane crash. Although her heart was not in it, she competed that year at the NFR. She fulfilled her commitment as a part of the Olympic Command Performance Rodeo team in Utah. Then, she quit rodeo, not sure if she would ever return. A year later, she was back, mainly because of the healing relationship with her horses. By 2010, Sherry had become the first cowgirl in history to have over $2 million dollars in earnings, and had her third World Champion Title, won on MP Meter My Hay, known as Stingray. In 2013, she and Stingray won her fourth, as she crushed the WPRA single-season earnings record with $155,889. She set a new average record with a total time of 138.15 seconds on ten runs, becoming the first barrel racer since 1997 to place in all ten rounds. Cervi has qualified to compete at nineteen National Finals Rodeos, which ties her for the most NFR qualifications alongside Charmayne James. She is now officially the highest earning barrel racer in the history of the sport, becoming the first WPRA cowgirl to earn over $3 million dollars in 2016. Cervi gives back by supporting the future of barrel racing through her non-profit organization, Sherry Cervi Youth Championships, which holds annual youth barrel races in California, Arizona, and Minnesota. She personally meets every contestant; awards numerous saddles, buckles, and prize money; and has launched an annual scholarship program. Though exceptionally talented, Sherry Cervi often attributes her success to her partnerships with her horses. She currently lives in Arizona with her husband of four years, World Champion Heeler Cory Petska, competing, horse training, and caring for her menagerie of animals that call her backyard home.